I'm sitting on a fold-down chair on a narrow corridor backstage at the Wales Millennium Centre. On either side of me, a handful of other journalists are silently reading their notes or fiddling with recording equipment. I bounce one foot nervously, and take a last look at the questions scribbled in my notebook. There's a rumble of footsteps approaching and, suddenly, the door to my right bursts wide and three figures stride through it. "Walk of shame!" quips a cheery Gary Barlow as they march past. My face flushes. I try to smile while simultaneously trying not to gawp. "The doctor will see you now," says Mark Owen in a mock Vincent Price tone, before disappearing into the interview room. The corridor falls silent again, aside from the hammering of my heart. After 15 years of working as a journalist and editor, I thought that I had mastered remaining nonplussed when meeting celebrities. But I've just met Take That - and suddenly I'm a teenager again. Earlier this year, an analysis of Spotify data for The New York Times identified that the songs you love as a teen are the songs that you'll love forever. The study found that, on average, women find their favourite songs at age 13, for men it's 14. I was still a year shy of my 13th birthday when, in 1993, I fell in love with Take That. It was the televised 'poll winners' party' from now defunct teen music mag Smash Hits that did it. Robbie swung his floppy hair about. Jason challenged Will Smith to a dance off. Howard played the guitar. Mark's performance of Babe was almost drowned out by the screams of the audience. Gary accepted the award for 'Best Group In The World'. I recorded the show on VHS, Sellotaped the corners so it couldn't be wiped, and watched it on repeat. My friends and I learned their Relight My Fire dance routine and argued constantly about which of us got to be Lulu in our lip-synch performances. In 1995, Take That released the anthem that, for me, encapsulates my teenage years - Never Forget. I've belted it out, hands in the air, with those same friends at our school graduation, our debs, in nightclubs, on holidays, at 21st birthdays, at 30ths, and more recently at weddings. The song seems to be about us - the giddiness and adventures, the friendship and support of having been teenage girls together that we'll never forget. It's around that sentiment that new stage musical The Band has been built. 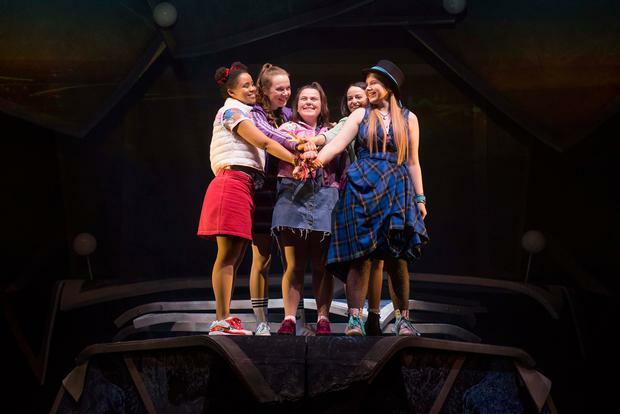 The show, which comes to Dublin's Bord Gáis Energy Theatre next month, has been widely assumed to be 'Take That the musical' but in reality it's the fans that are the subject of a sweet and moving narrative. The story begins in 1992, where five 16-year-old girls are hatching a plan to meet the boyband they're obsessed with. Later, we see them in the present day - grown up and grown apart, but still smiling when those familiar songs come on the radio. It would ruin the show to delve further into the storyline, but it's a tale of decent folk navigating personal traumas and learning the value of life-long friendships. The Band's writer, Tim Firth, is also the man behind Calendar Girls, which will give you an idea of the tone. The songs are, of course, by Take That - who I've come to Cardiff to meet on the first night of The Band's UK and Ireland tour. Starstruck nerves still jangling, I'm ushered into a dressing room where Mark Owen, Howard Donald and Gary Barlow are seated in a semi-circle. In the background, lots of people are milling about, but the three seem totally at ease in the centre of a whirlwind. They're immediately warm and chatty - asking about my flight and the weather in Ireland. To my right, sits Gary, looking groomed in a black velvet bomber jacket. He has a surprisingly small frame with delicate features, and looks youthful and fresh. When he speaks his voice is disconcertingly familiar - with that distinctive Manchester drawl that turns 'us' into 'uzzzz'. Howard, on the other hand, is a quieter and more imposing figure sitting dead ahead of me. He's wearing a green trucker's cap and a scruffy beard, his gaze intense and arresting. On the left, Mark wears one of his trademark fedoras. He's relaxed and upbeat, playing with his beaded bracelets as he chats away. The musical is a tribute to the fans, so I begin by asking whether the trio felt that they owed something to their audience for their years of devotion? "Lots of money," Howard says with a booming laugh, before Gary answers more seriously. "We constantly feel that," he says. "I always say when I'm on the social media thing, without the fans, there's no us. So when the idea of this came up - and the idea that the show was not actually going to be about us but about the fans - I was like: 'Yeah!'" Take That's presence at the theatre this evening is a top secret matter. After the show, they've planned to surprise the audience by joining the cast on stage for the encore. Despite it all being hush-hush, when we arrived hours earlier we passed a small knot of women silently standing guard at the stage door. One was clutching a TT tote bag that looked as though it had been treasured since the 1990s. Others had programmes from the musical ready to be signed. It was clear that these were the Take That faithful who track the group's every move. Do they have fans who've followed them since the very beginning? "There's lots of people on the front row that you recognise," Howard elaborates. "I think it's amazing. Not only from the 1990s but when we came back second time, one of the big things was that there were still people there who showed interest in us. Even from Robbie leaving, from Jason leaving… The support and the strength - they've been there for us." Perhaps because of their many ups and downs, they've often said from the stage that the fans are an integral part of Take That. "That's because we feel it," Gary says convincingly. "They are it really. We're like the channel," Marks adds. They certainly seem able to channel each other. After each of my questions, there's a split second of a pause where a look passes between the bandmates. It's as though the answer, and who is going to give it, is decided by some sort of shared consciousness. It's a synergy born of 30 years of working together, and it's fascinating to watch. I ask whether, over the years, they've been told what their songs mean to real people. They glance and then Howard quips: "Yeah, they say they don't like any of them!" All three laugh heartily. "We obviously have songs that people have related to over the years, old ones and new ones as well," Mark continues. "I know Rule The World is a ceremonial song for weddings, and A Million Love Songs too. Somebody came up to me not too long ago and said that they had Rule The World at a funeral as well. We're very lucky that these songs connect. That's what you want to do when you're writing a song, to make a song that connects." Do they know when they've written a song that it's going to be a big one? "Oh, I'm not sure about that," says Gary. "I'd like to say yes but I'm not sure. I think when we're writing, we're lucky because there's a number of us, so if we're all feeling good about it that's usually a good sign." Has any song ever really surprised them with the reception it's gotten? "A few have surprised me when they've not done well!" says Gary - cue more raucous laughter. "A few songs have done better as time has gone on. That Cry record we had, I think people would fail to tell you when it was out, but at the gig it goes down the best of any of the songs, and you just think, 'I don't get it'. These songs were much bigger hits, but then people go crazy to that song." The Band features a host of tracks from the three decades of their back catalogue, from Pray to Shine to The Flood. Tim Firth, a long-time friend of Gary's, was mainly responsible for narrowing down which songs fit his story. "I think when you've got a story it just picks the music it needs, and gets rid of the ones it doesn't need eventually," Gary says. It may be their songs, their dance routines and their logo, but there is not one mention of Take That in the musical itself. Instead, the girls rave only about the unnamed members of "the band". 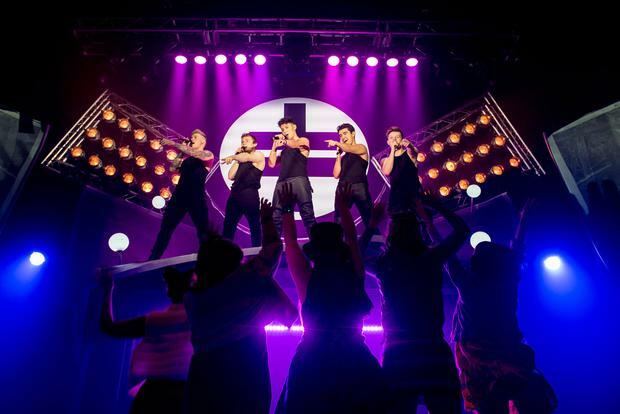 The teenage popstars that appear on stage were found through BBC TV contest Let It Shine. The group that eventually won a place in the cast is, in reality, called Five to Five. Was it difficult for Take That to hand their songs over to a cast and let them make them their own? "Not at all, it's beautiful to watch," Gary answers. "When you hear Five To Five, their voices and how amazingly they sing those songs, it kind of puts us to shame a little bit!" Howard says. "It made us step our game up a little bit," laughs Mark. "We all went back to singing lessons!" Gary adds. Surely it has to be weird watching a mini version of yourselves on stage? "I don't see them like that," Gary insists. "And actually, the audience don't either. They always say that we love the music but they've not replaced you." Despite the passage of time, it seems that nothing can replace Take That for their fans. Since they reformed in 2006 - as a foursome and later a trio - they've released five albums and toured constantly, including two stops at Croke Park. Last week they announced a Greatest Hits tour to mark their 30th anniversary, which comes to Dublin in April 2019. The audience will largely be made up of women who've loved them since the 1990s, many now with their own daughters in tow. And, of course, me and my friends with our hands in the air, singing Never Forget. In the meantime, we can relive our days of giddy teenage infatuation - still going strong for me it would seem, as I turn puce when someone offers to take a photo of me with Gary, Mark and Howard - at The Band. "I'm just proud of the whole thing," says Gary. "Especially when we watch the show because it's not just what goes on on stage. There's people off the stage, people moving the show from place to place. It's a big company and I'm proud that it's happened because of us, and that it's after all these years. Because there's not many bands, you can probably count them on one hand, that have had a musical written about them. I just feel proud that it's been us."